Monoi oil is made of two essential components: coconut oil and tiare flower, also called Tahitian gerdenia. They both grow abundantly in Tahiti and other islands of South Pacific. The coconut oil used in the production process comes from sun-dried coconuts. It is later combined with the tiare flowers. Traditionally 12 flowers are used for 1 liter of oil and they are macerated for a few days. The oil has been used for centuries in South Pacific, it is a traditional product which has many beneficial virtues for both skin and hair. How to use monoi de Tahiti? You can use monoi oil on both: body and hair. It has many beneficial effects and a beautiful, hypnotizing summer smell. You can apply the oil on your skin: it will become smooth, hydrated and nourished. You can apply it on your hair: It will make them soft, shiny and healthy looking! How to use monoi on hair? 1. There is a few ways of applying the monoi oil on the hair. 2. On dry hair ends: put a little bit of the oil on your finger tips and apply on the hair ends – they will become smooth, healthy and shiny! 3. As a mask: apply in the evening, go to sleep, wash your hair in the morning. Here is a guide how to do it : advice for applying the monoi oil on the hair! If you do not want to leave the oil on your hair overnight apply for 15-20 minutes before washing!On wet hair as a quick mask. Wash your hairand while still wet apply monoi oil (avoid your scalp!). It will nourish them and hydrate profoundly. After a few minutes wash your hair with a gentle shampoo. What DIY monoi products can be done at home? There is plenty of uses for monoi oil at home. See hair mask above (link). You can also use it as a perfect base for body scrubs! Add salt or sugar and scrub your body gently! Use tiny grains salt or sugar if you want to scrub your face or lips. It will not only smooth your skin but also nourish and hydrate and of curse make it smell beautifully! Manicure tip: soak your nails in a bowl of warm water for a few minutes, then massage your cuticles with a small amount of Monoi oil with the fragrance of your choice. It will be easier to push your cuticles back. Tanning with monoi or milking grease? Neither monoi oil or milking grease contains SPF (Sun Protection Factor). it means that they do not contain sun filters. You can obviously tan and accelerate your tanning using monoi oil, but first put a proper UVA/UVB filter! Here you will find a guide how to choose it(link to suntan guide). While the sunscreen is absorbed by your skin, you can apply tan accelerator. 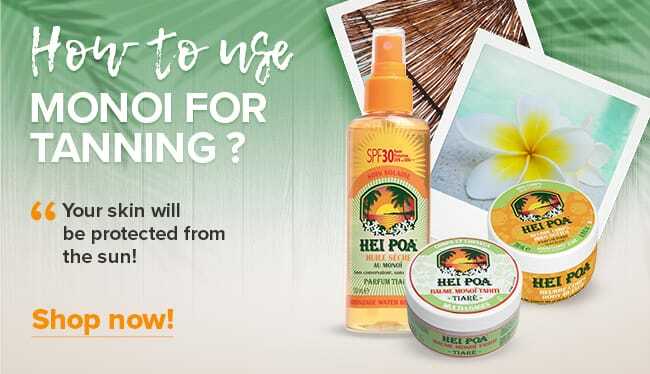 There are some tanning products based on monoi oil with sun protection, take a look in the offer of Hei Poa or Monoi Tiki! Remember: High filters will make your tanning safe. How to use monoi for tannning ? 1. First one is to apply a sunscreen on your skin, let the skin absorb it and apply monoi oil. Your skin will be protected from the sun and monoi oil will accelerate the tanning. 2. Second one is to buy one of the monoi bases products that serve for tanning and contain UVA/UVB filters such as monoi tanning milk or monoi dry oil. Many brands have such products in offer. On Brazilian Bikini Shop you will find for example: Monoi Tiki, Hei Poa, Heiva, Mareva. Pure monoi oil works great as after sun care! It does not tan itself, but can be applied after sunscreen. Monoi works also great as after sun care because it smoothens, soothes, nourishes and hydrates the skin minimizing harmful effects of sun exposure! Using Monoi de Tahiti with no protection cream is not recommended during the highest sunshine hours i.e. 10 a.m. – 2 p.m. Remember: avoid sun exposure at the highest sunshine hours or use protection cream adapted to your skin type. Depending on when you can and have time to do that, but regular use brings the best results! This beautifully scented ointment may be applied on both hair and body. It assures proper nourishment and hydration. Because of its oily nature it is good to apply it for night as a body oil and hair mask. You can also use it in smaller quantities during the day: for the dry hair endings. There are different products based on monoi such as: naturally scented perfume – these you can use daily. There is a whole variety of fragrances: the basic and pure tiare flower (Tahitian gardenia) as well as its mixtures with vanilla, grapefruit, coconut etc. There are monoi based sunscreens – use them whenever exposed to the sun and always while enjoying time on the beach! Use monoi oil and an after sun treatment, It will diminish harmful effect of sun radiation and greatly moisturizes dry skin. Monoi oil contains coconut oil, which has amazing moisturizing benefits for both skin and hair. It is soothing, protective and deeply hydrating. The inhabitants of the South Pacific have traditionally used monoi to protect their skin from the damaging harsh winds, intense tropical sun and drying salt water of their environment. The essential fatty acids in coconut oil repair hair damage and increase its shine. Does monoi accelerates hair grow? Monoi oil does not accelerate the hair grow itself. However, premature hair loss is the result of many factors, such as poor nutrient delivery to the hair, environmental stress, topical infection or insufficient blood flow. If you want to stimulate the growth of new hair, and protect the hair that you already have, massaging your scalp with monoi oil once per week is a quick and simple strategy to protect your hair. It also helps get rid of rashes and dandruff. Massage will make your skin healthier and more elastic so that it will help prevent hair loss. Monoi oil helps healing its damage and also prevents new damage from happening (excess of sun, salt, chemicals, mechanical damage). Monoi oil, as it contains coconut oil, helps stop protein loss in hair so that it helps stop breakage. This will make your hair grow longer, stronger and healthier. Monoi oil has no lightening effect on hair. However, it makes your hair glossy and shiny. Thanks to coconut oil your hair become healthy and smooth. Tiare flower give it a delicate and sensual scent.Tahitian women have used this secret for ages! Which monoi oil should I choose? Well, it all depends on the purpose. Pure monoi oil is great for hair and body treatment. It serves great as a hydrating, nourishing, revitalizing and soothing product. If you want to use it at the beach – use it after applying sunscreen or chooseone of the sunscreen monoi oil product line. It can come as a dry oil or body milk. It will contain a UVA/UVB filer and protect you from sun radiation. You can also find monoi based suntan accelerators – they are great, provided they contain SPF (Sun Protection Factor) or applied on sunscreen. Monoi oil comes in many natural fragrances – choose one based on your preferences! Tahitian gardenia, mango, pineapple, grapefruit, coconut and many more! There are also some dry monoi oils with glitter – they will highlight beautifully your summer tan! Depending on the purpose you want to use the oil, choose one of the wide product range we offer. And remember – choose only original products, they usually have the label MONOI DE TAHITI APPELATION D’ORIGINE. This is "Designation of Origin" label (DO) guarantees the product’squality and assures that it produced in accordance with tradition and the local Polynesian economy. What monoi oil should I choose for the hair? You can choose any type of pure monoi oil for your hair. Your choice may be based on the fragrance you like. There are also monoi product especially designed for hair care, for example from Hei Poa or Heiva brand. These include both shampoo and conditioner. What monoi oil should I use to sun tan? 1. Apply a proper sunscreen, let it be absorbed by the skin and only then put monoi oil. It will help you sun tan faster, but be careful not to exaggerate with the time spend on sun, especially between 10 a.m. and 2 p.m.
2. Choose one of the monoi based sunscreens such as monoi dry oil or monoi milk and enjoy the day on the beach safely and beautifully scented. What monoi brand should I choose? 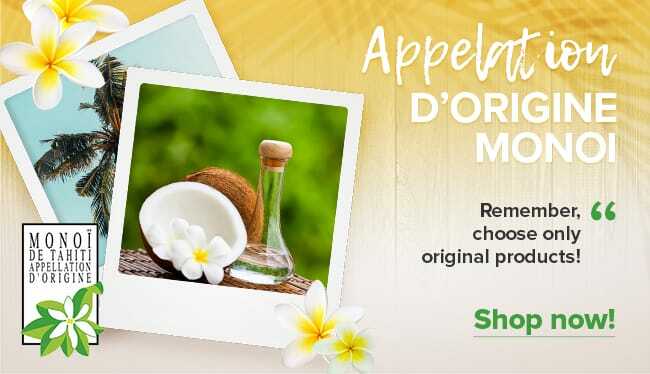 Choose what you want, according to your style, taste and of course the price you accept.Choose only original products, they usually have the label MONOI DE TAHITI APPELATION D’ORIGINE. This is "Designation of Origin" label (DO) guarantees the product’s qualityand assures that it is produced in accordance with tradition and the local Polynesian economy. Where to buy monoi de Tahiti? You can buy the real Tahitian monoi oil on brazilianbikinishop.com – we have a variety of brands and their products. Brands such as Monoi Tiki, Hei Poa, Heiva, Mareva and others are in our offer and we constantly work to develop brand and product range in order to meet your expectations. We offer you original products of the highest quality, produced in accordance with tradition and the local Polynesian economy. In our offer you will find pure monoi oil, monoi oils with natural fragrances such as vanilla, coconut, pineapple etc. We also have hair product (shampoos & conditioners), monoi oil sunscreen’s (dry oil and body milk), after sun products, fragrances, soaps and much more! Where to buy monoi for hair? 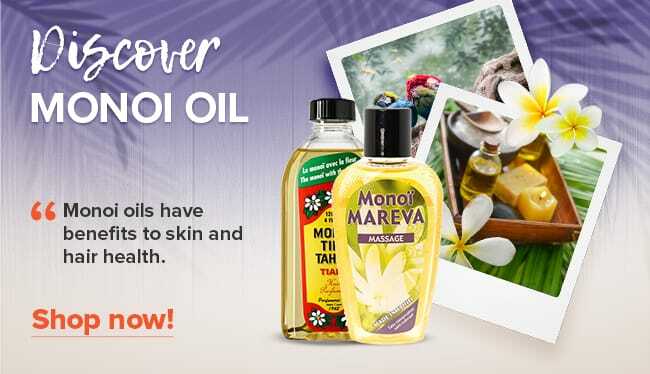 You can buy the real Tahitian monoi oil on brazilianbikinishop.com – we have a variety of brands and their products that are also especially dedicated for hair care. Brands such as Monoi Tiki, Hei Poa, Heiva, Mareva and other are in our offer and we constantly work to develop brand and product range in order to meet your highest expectations. We offer you original products of the highest quality, produced in accordance with tradition and the local Polynesian economy. Apart of a traditional pure monoi oil that you can use for the hair we also have hair product lines i.e. monoi shampoos and conditioners. Monoi oil or argan oil? Monoi oil has anti-fungal and antimicrobial properties. The medium chain fatty acids that are in coconut oil (which is a basis of monoi oil)give moisturizing properties. Because of their small size, they penetrate the skin and hair very well. Monoi oil is not a significant source of Vitamin E but it contains more phenols than argan oil. Argan oil contains an abundant source of Vitamin E as well as other antioxidants (including carotenoids) making it an excellent oil for reducing and preventing the signs of aging. Argan oil’s fatty acids are excellent at hydrating and nourishing the skin and hair. Which is better for what? - For dry skin it is believed that monoi oil is better because it is more deeply hydrating than argan oil. - Monoi oil is better for scalp skin problems as it spreads well over the scalp. - Argan oil is better for oily skin because it won't clog your pores like coconut oil may do. - Monoi oil served great as a body oil because it spreads easier and had great moisturizing benefits. - Argan oil is believed to be better for dry hair ends because it makes your hair soft and manageable without leaving it greasy. However, monoi is better as a hair mask and if you use it with moderation you may use on dry hair ends and they will look beautifully and shiny. This is why you should decide for yourself what you prefer and what serves you best! Monoi oil or shea butter? Both shea butter and coconut oil are known as natural skincare products. While they are fantastic emollients and great moisturizers, each has its own distinct benefits owing to antioxidants and other healing compounds. While it's widely maintained that both Shea butter and coconut oil also act as sunscreens, but they do not have UVA/UVB filters. Use them only alongside, not in place of, your everyday sunscreen. Shea butter is derived from the nuts of the Karite tree. It contains fatty oils that provide intense moisturizing. It is also rich in vitamins C and E which both help to neutralize sun damage, and has been known to have anti-inflammatory properties that help treat topical skin conditions such as dermatitis. The fatty acids in coconut oil (which is a base of monoi) work as a reinforcing barrier on the skin, sealing moisture in for intense, long-lasting hydration. It also contains high quantities of lauric acid, which can be used to treat viral, fungal and bacterial skin conditions like warts, athletes foot or acne. Coconut oil is often an ingredient in creams and lotions but can also be found in body scrubs and soaps. You can try both, and choose what suits you better. If you like both products you can use them simultaneously and even mix them! 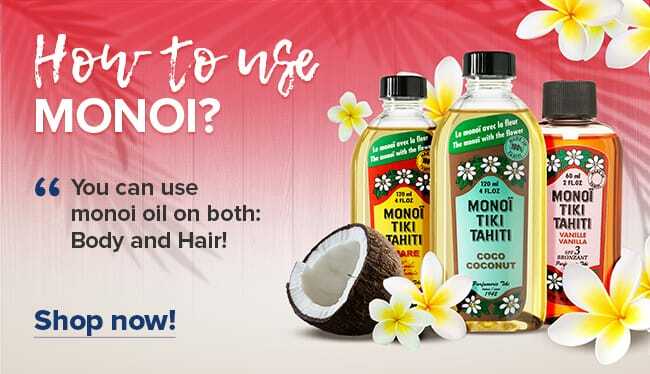 Monoi oil or coconut oil? Monoi oil is based on coconut oil, sometimes it called “coconut oil’s sexier cousin”. It is an infused perfume-oil made from soaking the petals of Tahitian gardenias in coconut oil.So basically it shares coconut oil’s virtues plus it has an amazing scent of tiare flowers. Monoi oil has been shown to have tremendous moisturizing benefits for both the skin and hair. It has been used for centuries by Polynesian women. The essential fatty acids in coconut oil, like lauric acid, repair hair damage and increase shine. Monoiis also loaded with protective antioxidants like vitamin E and ferulic acid, a plant-derived anti-inflammatory that neutralizes free radicals, fights signs of aging and treats certain skin conditions that predispose to infections, most notably atopic dermatitis. What is monoi oil expiration date? There is no expiration date really. To protect its valuable virtues it is best to keep it in a cool place without light, but remember: monoi will be solid at cold temperatures, just warm in the hands to wake up its delights… It may go solid / liquid many times, it does not affect its beneficial effects. What is monoi oil and its origin? 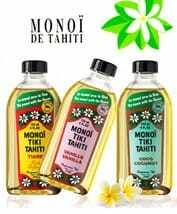 The monoi oil comes from the maceration of coconut oil and fresh tiare flowers (Tahitian gardenia), which both grow abundantly in Tahiti and the islands of the South Pacific. Coconuts are harvested from the plantations and dried in the sun. They are very important in Pacific culture and widely used in diet, spiritual and material life of the people. Tiare flowers are so highly appreciated that besides of their aesthetic and cosmetic values they have even found their place in the emblem of both Tahiti and the Cook Islands, and is also part of the Tahitian airline logo. Traditionally 12 flowers are used for one liter of coconut oil. For several days they infuse its aroma into the coconut oil (made of sun-dried coconuts) and this is how the traditional monoi oil is created. The traditional tiare flowers ointment has lots virtues, mainly used for body and hair. Its hypnotizing and sensual scent is highly appreciated. - Packaged in the bottle, the monoi oil is liquid, but it becomes solid in the temperature is below 24°, therefore it must be placed near a heat source to become liquid again. Before application, you can also warm the oil in your hands, rubbing them against each other and it will become liquid in no time. - Add a few drops of monoi oil to your bath and the water will become soft and beautifully scented. This procedure will make bath-time a wonderfully relaxing moment, while protecting the skin from chlorine and hard water. You can also find shower gels with addition of monoi flower oil. 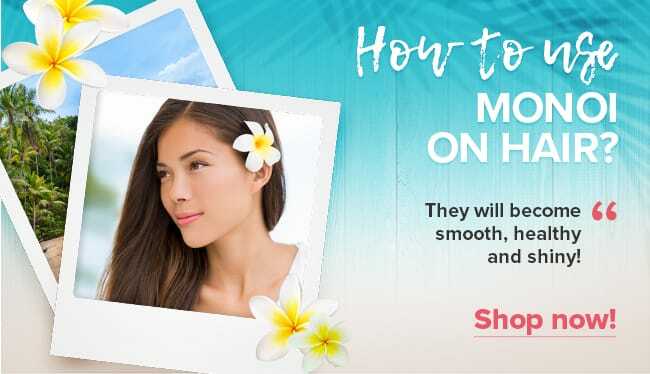 - Apply on moist skin, this Tahitian oil is very moisturizing as an after shower care, it can easily replace butters and body lotions with questionable compositions. You can apply it just after shower or bath, when you skin is still a bit dump. - Applied on dry skin, it provides a satin, slightly shiny effect that sublimates sun-kissed skin during the summer. - You can also treat with the oil these parts of your skin that are usually harsher e.g. elbows, ankles or constantly exposed to sunlight: hands, cleavage etc. They will become smooth, soft and finely nourished. - If you add a few drops of monoi oil to salt or sugar you can make a homemade scrub for whole body and face (for face use tiny salt or sugar grains). The scrub will not only smooth your skin but also perfectly nourish and hydrate. - Contrary to some popular belief, monoi oil itself is not a sunscreen, but rather an excellent after-sun care. It can help tanning if it is applied on prepared skin but always use it with a proper UVA/UVB filer. After a sunburn however, it helps regenerate the cells and prolongs the tan. - There are special sunscreen products like monoi dry oil or monoi milk from the traditional brands such as Monoi Tiki or Hei Poa which have SFP ranging from 3 to 50. Some of them additionally assure beautiful shiny effect. The skin is left with a delicate fragrance of Tiare flowers. Some are water-resistant. All are paraben free and natural. Besides the sunscreen function they moisturize of the upper layers of the epidermis. - Finally the monoi oil has relaxing and soothing virtues, ideal for healing muscle sore and tension. Therefore, it is widely used as a massage oil. What is more, its most pleasant and exotic scents contribute to general relaxation and well-being. How to implement monoi oil into face care? - An unknown use of the monoi is to add a few drops of oil to the day or night cream to strengthen the moisturizing and protective power. This tip is mainly for dry and very dry skin, but will not be suitable for oily skin. - Used alone: squeeze a drop of oil onto the fingertips and apply gently in small circular movements to the parts of the face nourish to nourish and soften. - The monoi is also very effective for make-up removal. If a waterproof mascara refuses to leave with a conventional makeup remover, you can add a few drops of oil on a cotton and gently rub the eyes. The makeup will dissolve in no time. - Mix a few drops of monoi oil with finely grained salt or sugar and you will have a perfect homemade face scrub with all nourishing and hydrating virtues. Some monoi oil product lines are specialized in hair care. In this regard, a monoi hair oil is as effective as the coconut oil and helps repair the endings, make the hair soft and shiny, give it strength. vigor and discipline that facilitate its care. On the islands of Pacific the hair is always exposed on damaging effect of sun, salty water and wind. Monoi oil serves as a great protection and hair nourishing product. its repairing and conditioning properties leave the hair soft, supple and shiny. What is more, it makes your hair smell beautifully with tiare flowers! - For a daily care, you can simply apply a few drops of monoi oil on the dry hair endings, in order to moisturize them and make them shine. Don’t rinse. - Used before exposure to UV or sea salt, it helps protect hair from damage and keeps it beautiful. - Pour a little oil into the palm of your hand. Spread it between your two hands and then apply to your hair and massage. Leave it on the hair for 15-20 minutes. Then, wash your hair with a gentle shampoo. Repeat the treatment on a weekly basis. - For an optimal result, it is the best to apply the dry oil as a night hair mask, on all its length, before rinsing it with a soft shampoo in the morning. This brings great long term results, so it is important to repeat the treatment every week or two. Monoi oil is great for your nails and hand skin. You just need to apply it and rub into. It also helps to remove your nail cuticles: after a while of soaking in the oil it is very easy to push them back. Your hands will smell beautifully with Tahiti flower! With its bewitching scent, Monoi also makes a very good summer fragrance. You can slip a few drops on your neck, in your hair, or on your wrists. Some brands also offer original fragrances with natural scents, such as grapefruit or vanilla monoi. This traditional care originating from Tahiti is today in all shops, but how to find a product with a good composition? Organic oils remain among the best options, without toxic or chemical ingredients, without perfume, paraffin or alcohol. The so-called "traditional" oils are generally also of good quality, guaranteeing a content of more than 90% in pure monoi. In this respect, it is worth to mention monoi oil products made by Hei Poa, Monoi Tiki, or Heiva. At Brazilian Bikini Shop we offer a wide range of Monoi Tiki products: Bronzing Oil, Sun Oil, Shower Gel, Massage Oil, Shea Butter, Sunscreen, Hair Mask, Tahitian Flower and much more!